Search Results for "cough and cold"
Portrait of Female Suffering From Cold Cough and Sore Throat, Looking at Camera With Sad Face and Sitting on Large Bed in Spacious, Bright Room. Pretty blonde is coughing on blurred background. 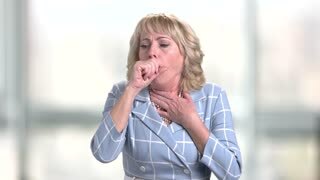 Unhealthy mature woman having cough. Woman suffers cold. Pretty woman is coughing on gray background. Mature woman suffers cold. Portrait of woman with sore throat. Sick grandmother sitting on couch in room, coughing, freezing cold. Portrait of nice old Caucasian lady wearing green scarf and blanket. Close-up. Indoors. Sick African guy wearing scarf sitting on couch, coughing, freezing cold. Portrait of ill young man drinking hot tea. High temperature. Heat. Indoors. A young beautiful woman stands near a window and coughs. A cold girl has an attack of cough at home. Allergies, colds, bronchitis, asthma. A young beautiful woman sitting home on the sofa. and coughs. A cold girl has an attack of cough at home. Allergies, colds, bronchitis, asthma. The child coughs. Portrait of a cute little girl close-up. The concept of cough, colds, viruses. Ill African young man wearing beige scarf sitting on gray couch with colored pillows, coughing. Attractive guy freezing cold, drinking tea, looking away. Living room. Ld Window Man Cough Sick. Lens distorted scene: a sick man badly coughing, standing near a window on a cold day. Vhs Window Woman Cough Pill Sick. Fake VHS tape: a sick woman coughing and taking pills, standing near a window on a cold day. Funny comedy shot. F 8 Window Woman Cough Pill Sick. Fake 8mm amateur film: a sick woman coughing and taking pills, standing near a window on a cold day. Funny comedy shot. Window Woman Sick Cough Cover. A sick coughing woman taking a pill while standing near the window in a cold day. Young attractive girl, cold outside, sore throat, coughing. Man coughing into a paper handkerchief. He has a cold, headache, fever, chills. Girl with cold, drinking tea and coughing sitting bywindow.